Get 6 months to pay $890.00 with PayPal Credit! No payments + no interest if paid in full in 6 months. 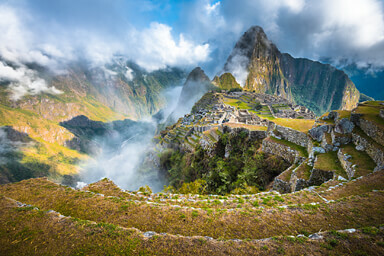 Don't miss your chance to hike the Inca Trail in 2020! The government restricts the number of Inca Trail permits to 500 per day (inclusive of porters). Demand for this once-in-a-lifetime adventure is extremely high, and permits are often sold out (and non-transferable) as much as a year in advance. We expect they will sell out even faster this year. Get ahead of the pack and reserve your permit now. Our Peruvian operator, Valencia Travel Cusco, will secure your spot as soon as permits drop. Plan ahead and hike in the footsteps of the Incas. After a particularly early breakfast, depart from the campsite around 5:30 am in order to arrive to Inti Punku (‘Sun Gate’) before sunrise. From here, you’ll experience your first phenomenal view of Machu Picchu at dawn. Walk on to this iconic ancient city, where your guide will lead a 2 hour tour, and then enjoy some time to explore on your own. Walk or bus to Aguas Calientes for lunch, then take a train ride back to Cusco for the evening. The hike to Machu Picchu was an unforgettable experience made even better by our fantastic guides and porters. We were overwhelmed by the service, food and support we received. We highly recommend this adventure. In our opinion it's the only way to see Machu Picchu! Please do not make travel arrangements until your trip is confirmed by Valencia Travel. Your date cannot be confirmed until you provide Valencia with your personal information. Voucher valid until 12/31/20. To redeem your voucher, please reach out to Valencia Travel as instructed in your confirmation email. Reservations are subject to availability and Valencia Travel will do whatever they can to secure your desired dates. Please do not book travel until your trip is confirmed by Valencia Travel. Your date cannot be confirmed until you provide Valencia with your personal information. Voucher expires December 31, 2020. Departures are available almost daily every month except February. Please do not make travel arrangements or book airfare until you have received confirmation from Valencia Travel and confirmed your permits. If your reservations are not yet confirmed, you can change your travel dates for this year or to 2021 for a $200 change fee. After your reservations are confirmed, the change fee will be $400. Change of travel dates is not guaranteed and requires approval by Valencia Travel. Do you have upgrades? Is there a luxury option available? Yes, please contact our customer service department to explore the premium Inca Trail package. You'll be staying in a Cusco hotel for 3 nights and camping for 3 nights. Pricing is based on double occupancy accommodations in a shared room and 4-person tent. Hotel rooms include 2 separate twin size beds. Solo travelers or the odd-numbered person in your group may opt to share with another person of the same gender (if available). If this option is not available, or if you would like to have your own room, you'll need to pay a single supplement of $400 directly to the operator. Daily breakfast will be included (with the exception of breakfast on day 3), along with all meals while on the Inca Trail (3 breakfasts, 3 lunches, 3 dinners and snacks throughout). Meals will be served buffet-style with an array of offerings. Snacks and hot drinks will also be provided. Vegetarian diets will happily be accommodated at no extra charge on the trek. What is the difference between the Inca Trail trek, Salkantay trek and Lares trek? The Inca Trail is certainly the more famous option, though the Salkantay and Lares treks both gain in popularity each year. In efforts to control the numbers on the Inca Trail, the government restricts access by awarding only 500 non-transferrable permits per day (with up to 300 going to guides and porters). The Salkantay and Lares treks currently have no such restriction, making last minute trips much more of a possibility. Permits for the Inca Trail during peak season (May – September) are often sold out several months in advance. We partner with Valencia Travel to offer departures for all of the routes detailed below. If you are interested in booking a trip on another route that isn't currently on the site, please give us a call and we can help you make arrangements.